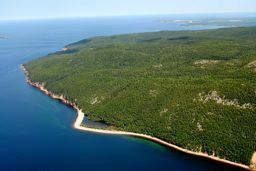 Kluscap Wilderness Area protects much of the northern part of Kluscap (“Kellys”) Mountain, between St. Anns Bay and Great Bras d’Or. It is a striking landscape, where steep forested slopes rise sharply out of the sea to a narrow plateau of 300 or more metres elevation. Kluscap Mountain is a sacred Mi’kmaq site. It is said that the great prophet Kluscap (or "Glooscap") once dwelled in the ocean-side cave near Cape Dauphin, at the northern tip of the wilderness area, and will one day return. The lore and mystery of the cave, known locally as the “Fairy Hole,” coupled with outstanding coastal scenery, attracts visitors who arrive by informal trail or by sea. Those wishing to explore this wilderness area will find a wide variety of landforms and habitats across a broad elevation gradient. Cobble beaches, coastal cliffs and caves, and barachois ponds extend for almost 6 km along St. Anns Bay, interrupted only by the occasional stream flowing into the bay from ravines. These ravines provide a refuge for tall white pine and hemlock, while the more exposed coastal slopes support black spruce, balsam fir and hardwood forest. The windswept plateau includes small ponds and wetlands surrounded by stunted forests. The scenery is stunning. Nesting bald eagles can be seen overhead, and pilot whales and dolphins swim in the adjacent waters of St. Anns Bay. The diversity of ecosystems here ensures good representation of Kellys Mountain natural landscape in the provincial protected areas network. Kluscap Wilderness Area presents opportunities for learning about and honouring Mi’kmaq culture and spirituality. The Province and the Mi’kmaq of Nova Scotia intend to explore options for cooperatively managing this wilderness area.